Banks can’t do social media. This is how I first engaged the audience at the ‘The New Balance of Power‘ event organized by the Financial Services Forum in partnership with Linkedin. Yesterday, James McErlean – Category Head EMEA Finance Linkedin and Andrew Porter – Vice Chairman of the Financial Services Forum invited me to chair the discussion panel at their event on social media in financial services. It was a pleasure to contribute to the success of my fourth FSF event on social media in banking as a speakers or chairperson. Now, I invite you to watch my video wrap up where I will talk you through some of the speakers’ key comments and initiatives. The banking industry is extremely late with social media: I am having the same conversations now that the ones I had back in early 2007: Banks still suffer from the “pandora’s box syndrom“, they still struggle with ownership and content, and they are far from tapping the voice of the customer. Social business seems more promising in the short term. 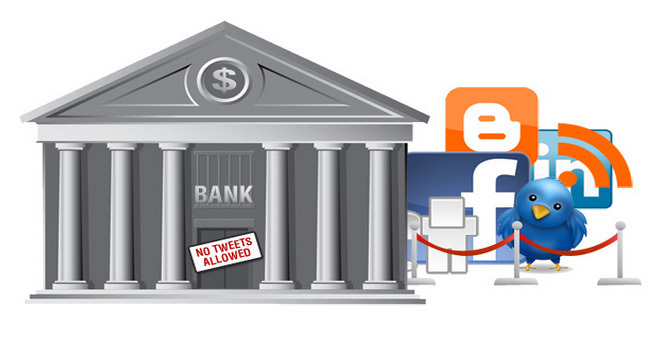 But now that social media is one of the banking industry’s top 5 risks, things might just change soon. Social conversations monitoring solution providers, be ready to boost your sales. Crowdsourcing solution providers, hold your horses for a bit longer. So after watching my video, do you agree with me? Join the conversation here or on our facebook page!